Unions help working men and women make it to the middle class. It’s not a coincidence that when union membership declined in California, so did living wage jobs. That’s why organizing is a top priority in the IAM. 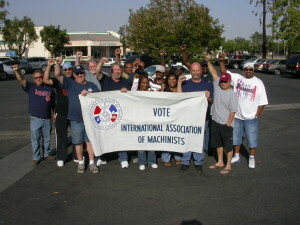 Organizing brings the benefits of union membership to more working families. Organizing benefits current members too, because more union members means greater clout at the bargaining table and in our legislative halls. Union membership benefits the communities where we live, because employers must compete with union shops to attract and retain good workers. All boats rise with a rising tide. If you work in a non-union shop, statistics show that you earn less money and have fewer benefits than you would if you worked in a Union Shop. That’s because unions provide a http://legitest.com/blog/make-test-data-driven-legitest http://wagegarnishmenthelp.com/wagegarnishmenthelp.com balance of power between employers and their employees. Union members make more money because they negotiate the terms and conditions of their employment at the bargaining table. Non-union employees must bargain one-on-one with their employers. There’s strength in numbers, and it’s plain to see who employers are more inclined to listen to. Without a union, you are at the mercy of your employer to decide your wages, benefits and working conditions. How much further ahead you would be now if you were covered by a union contract last year? The IAM is an advocacy organization created and governed by its membership to pressure government, business and community leaders to support issues important to working families. Representing our members means more than facing down employers at the bargaining table. We can’t succeed at the bargaining table without the collective strength of a strong and engaged membership. You and your family members and your friends deserve job security, safe working conditions, overtime pay, medical benefits and defined pension plans. The only way to achieve these things is through collective bargaining. Your District 725 Organizers can help. Contact us today!